This narrated video demonstrates the endoscopic insertion of O’Donoghue nasolacrimal stents into a patient whose DCR has failed because of internal ostium fibrosis. DCR failure is typically from fibrosis over the external ostium. However, sometimes and in some series in as many of 50% of DCR failures(1), fibrosis only occurs over the internal ostium, or common canalicular opening as in this case. Secondary O’Donoghue tubes are being placed to overcome and stent the obstruction. Endoscopic visualisation enables close observation of the internal ostium to ensure that a false passage is not made. Multiple gentle attempts are made to pass the stents before they are successfully passed through the ostium. It is very tempting to try and force the stents through, which invariably creates a false passage, but delicate angulation, allows the ostium to be found. The stents are secured with a small segment of size 8 feeding tube and a couple of liger clips. 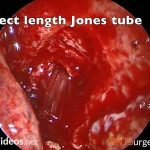 Whilst the tube is being secured, the position of the loop of the stent at the medial canthus is carefully checked or gently lifted with an instrument such as a ball probe to ensure that it is not pulled tight risking cheese wiring of the puncta. There is no evidence to guide how long the stents should be left in situ. However, it is probably prudent to leave them at least for a couple of months, and if the epiphora resolves and there are no adverse effects from the stents being in situ, they can probably be left indefinitely. Lin GC, Brook CD, Hatton MP, Metson R. Causes of dacryocystorhinostomy failure: External versus endoscopic approach. Am J Rhinol Allergy. 2017;31(3):181-5. Ali MJ, Psaltis AJ, Wormald PJ. 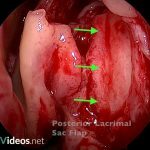 Dacryocystorhinostomy ostium: parameters to evaluate and DCR ostium scoring. Clin Ophthalmol. 2014;8:2491-9.